It was that fateful day in 2001, enchanted by the Light, I sought what only brave men sought, and willfully “knocked on the door from without”. Now, after six years, after treading that “ladder that leads to fame in our mystic circle”, here I am in the East; in this sacred seat, which I deem to be the place where the Craft will fulfill its final reckoning on who I was, who I am and who I am to become. My brethren, it is a glorious day, and together with my family, I share with you the felicitations of my spirit. I have always considered our Fraternity as a family affair, such that all that matters in my Masonic life, matters as well to my family. Their piety stood by me in all my Masonic quests; and now, in the culmination of one of those quests, my family stand beside me basking in your fraternal presence.. I thank my wife, ang inyong Ateng Lucy, my daughter Jocelle, and son Jolu, for their unwavering support. It is with utmost appreciation that I extoll our brother from Sta. Rosa Lodge No. 297, the AFP Sergeant Major, Bro/CMSgt Renato T De los Santos, for being our Guest of Honor and Speaker. Siya po ang pinakasiga at pinaka-busy sa lahat ng Enlisted Personnel. Notwithstanding, di niya ako hinayaang magdalawang salita at agad siyang tumugon sa aking alok. As a fellow Enlisted Man of the Philippine Army, I found his role in our affair very apt and fitting. Even our venue now, the AFP Enlisted Personnel Recreation Center, then known as the Enlisted Personnel Club, has sentimental meaning. In this same venue, I held fellowship after being raised to the Sublime Degree of Master Mason in 2002. After five years, finally, I am now in the East. Let me share this moment with my fellow Enlisted Men. For I believe that the soldier’s life, ideally circumscribed, is indeed a Masonic life. But could I have made it thus far, from the floor to the East, without the trust, confidence and support of my Brethren? Particularly, my brethren at Marikina Lodge No. 119? This opportunity to be of real service emanated from all of you. To mention our countless anecdotes, which I have safley deposited in the Masonic almanac of my heart, will consume an entire lifetime. But allow me to appreciate some of the Lodge elders – VWs Mario Macatangay, Greg Mendoza, Cesar Abaya, Rolly Ubaldo, Fred Espino, Nanie Cruz, Ric Valdez, BJ Torres, Froilan Madrinan, Ferlu Sudario, Rey Cadiz, Delfin Del Rosario, and Bubot Burdeos; WBs Art Cacal, Andy Andres, Jun Romero, Paul Fernandez, Dante Ypil, Mike Cruz and Zito Ochoa – their fraternal guidance illuminated me at climactic points in my Masonic life. To Bros Ed Pasco, Nhoy Balite, Conte Sabate, Rolly Acosta, Emmanuel Ambrona, Polding Romero, Arnel Bantayan, Majid Benito, Edwin Balles, Nelson Bautista, Lloyd Soria, Edwin Maquinto, Tony Munsayac and Joel Villanueva whose friendships kept me in Masonic company. And to Bro Bugs San Juan, who six years ago, ignited the tinderbox of my Masonic flame. And to all the brethren, from Marikina and other Lodges, whose lives touched my own…Di ko na po kayo mabanggit lahat ngayon, nguni’t lahat po kayo ay kalakip na ng aking Buhay Masonerya. Pagbibigay pugay din po sa ating Installing Team, headed by WB Art Cacal. Your labors po are much appreciated. At sa mga dignitaries at kapatid na dumalo…Maraming salamat po sa panahong ginugol ninyo sa aming lohia ngayon. 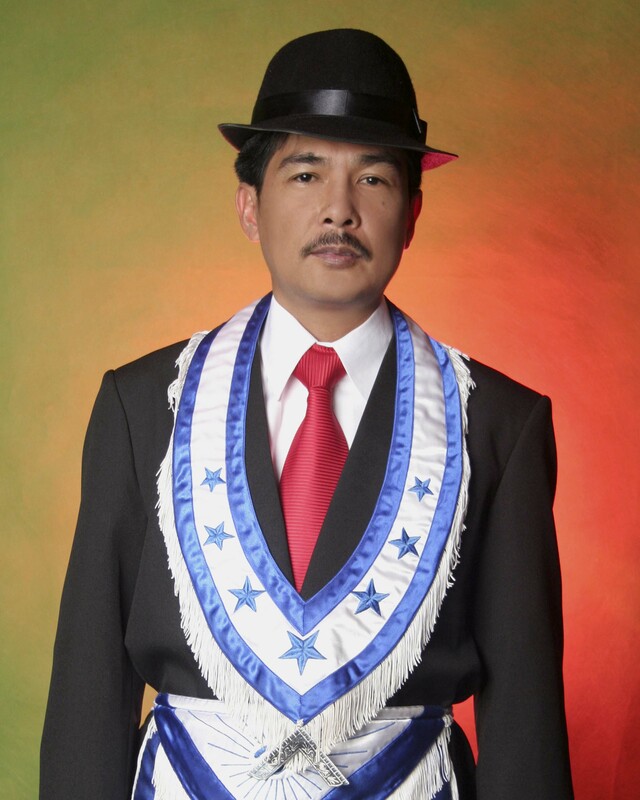 Amid the joy of festivities and the ecstatic feelings, I realized that my term as Master of the Lodge occurs in the year of Philippine Masonic upheaval. As it is anticipated that 2007-2008 will be a milestone for the Grand Lodge and its subordinate Blue Lodges, it is also fervently hoped and prayed that Unity, Truth and genuine Brotherly Love will prevail in the long run. It will be a long and ardous journey, from this day onwards, to April, during the ANCOM, until we once again elect our new set of Lodge officers in December. Join me, my Brethren, in upholding peace, goodwill and harmony, in the truest essence of extending our Cabletows to all our worthy brothers, “withersoever dispersed”. Concerning our usual works as a Lodge, I aim to continue our traditions on charitable projects, medical/dental missions, Masonic education, Sunshine, social awareness and fund raising. In line with these, we have scheduled an Outreach Program at the Home for the Aged, located at Bgy Parang, Marikina City, some weeks after the ANCOM. Brethren, I am fraternally pleased to inform you that initial funding was already seeded, in the amount of P3,000.00, by a worthy brother, who prefer anonymity. Sa ngalan ng Marikina Lodge, Salamat Bro! Also, our Tree Planting Project is slated to be conducted through the supervsion of VW Rey Cadiz. On the other hand, our annual medical and dental mission is now well on the trestle board. On Sunshine, Chaired by the Senior Warden, Bro. Leopoldo Romero, it has been the tradition of Marikina Lodge to look back with fraternal love and gratitude to its elderly members, life members, brethren who are ill and distraught and unable to attend our labors. Bro Senior, we shall continue the noble tradition of rekindling their Masonic flame and spreading over them the Sunshine of Relief. On Social Events and Fellowships, Chaired by the Junior Warden, Bro. Arsenio Bantayan, we will continue our Monthly Boodle Fight and Fellowship, which we initiated last year and proved to be our unique way of fostering esprit d’ corps. Bro Junior, I expect your esteemed presence in our labors, and in your area of concern, our fellowships. On Membership, Chaired by the Lodge Secretary, VW Gregorio Mendoza, whom I will hold equally responsible with me in the conduct of screening, background investigations and overall assessments on the petitions for Blue Lodge Degrees. Our doors are open for those who sincerely seek the Light, however, I strongly recommend that we go back to the basics of our teachings, and let none pass within our portals who are not duly qualified and truly worthy! On Finance, Chaired by VW Rolando Ubaldo, who has since been our Treasurer, I have no doubts on the continuance of the usual transparency in our books and records. Bro Treasurer, my utmost confidence is in you. On Ways and Means, Chaired by our Immediate Past Master, WB Miguelito Cruz, whom we shall be working with in our Fund Raising Projects. Every Worshipful Master aspires, in someway, to contribute to the coffers of the Lodge during his incumbency. Brethren, do assist me and the Committee in the fulfillment of this endeavor for our Lodge. This is in conjunction with the Committee on Special Projects, Chaired by WB Jose Balite, whom I know will come up with creative ideas on projects that are Masonically aesthetic, reasonably viable and financially productive. On Lodge Preparation, I expect the early birds during Stated Meetings, led by the Custodian of the Works, VW Maricio Valdez, to lay out and square our workplace, prepare our tools of labor and gear us to proper Craftsmanship. Last but not the least, on Masonic Education, Chaired by our Lecturer, VW Delfin Del Rosario, our monthly “Pearls of Masonic Wisdom” shall be extracted from the annual “Lesson Plan” of the Grand Lodge. However, I believe that with the experience and knowledge of the Chair, we shall learn more, than what is ascribed. I ask your indulgence, Committee Chairs, to furnish the Lodge with your written Committee Reports, as stipulated in Article 10 of our updated Masonic Law Book. Allow me to mention our Official Lodge Website, the Official Webmaster is yours truly. In this day and age, when the order of things tends to modernization, our Lodge, our Ancient Fraternity must travel on that information highway and properly utilize technology for the benefit of the Craft. Also, I highly recommend the revitalization of our Official Lodge Newsletter, the River Delta, and direct its precursors, VWs Gregorio Mendoza and Fred Espino, WBros Mike Cruz and Dante Ypil and Bro Bugs San Juan, to undertake its publication. On behalf of the Lodge, I enjoin all the Brethren to a participation in our labors and in our fellowships. With this regard, allow me to underscore our Lodge theme – “Unity and Industry” – which includes both our transcendental goals of harmonious existence and our corporal goals of concrete achievements. Amid the seemingly indomitable task that lay ahead as Master of the Lodge, inspiration conquers my fears, and zeal overcomes my doubts. I owe that inspiration to my Family, and that zeal to Freemasonry. Overall, I owe everything to the Great Architect…I owe Him the resonant echoes of my past, the vibrant colors of today, and the enigmatic road to my future. My heartfelt thanks to each and everyone for gracing our public installation. Do partake in the blessings which the Great Provider has bestowed on us. And may your stay be fruitful and truly Masonic.